221 B Baker Street is the London address of the world's most celebrated detective, Sherlock Holmes, and his dedicated companion Dr. Watson. In this game, players start at 221 B and travel through the streets and alleys of London picking up clues and attempting to solve some of the most intriguing cases Holmes and Watson have ever faced. 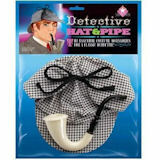 Each player assumes the role of Holmes and matches wits with the other players to determine who possesses the most skillful deductive powers. The first player to figure out the correct answers to a particular mystery or crime, return to 221 B and announce the solution, is the winner. This game includes twenty original Sherlock Holmes adventures written especially for this game. Sherlockians know 1896 as "The Missing Year". What really happened? HG Wells developed a time machine and issued a challenge to the great detective. Now you can spin through America with Holmes and Watson helping them solve twenty of the most baffling unsolved crimes of the 20th century. This game includes 20 all-new, all-true mysteries of the 20th century, such as: the JFK assassination, Jimmy Hoffa's disappearance and Has Elvis really left the building? Prices shown are accurate as of Dec 23, 2017 18:03pm CST. Please follow the links for current pricing. Like Professor Moriarty, Sherlockian.Net sits in the centre of the Web. 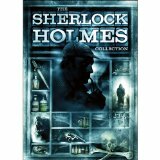 This site is maintained by Chris Redmond, author of A Sherlock Holmes Handbook and other Sherlockian books. 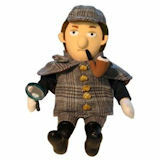 The official website of the greatest detective's adventure video games, featuring information about various Sherlock Holmes video games. 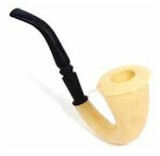 This is "the official Sherlock Holmes website". Sherlock Holmes represents the following values: He is resourceful, quintessentially English, intelligent, learned,insightful and relishes a challenge. Lots of great historical information here.